This year I began building my own business, an incredible process, where you get to choose your future down to the smallest detail. My experience so far has been positive, and for that, I am thankful. Success VERY much depends on so many other people. I have little interest in “being my own boss,” I simply want to build something of value, something that helps people achieve their goals, and makes their life brighter. Are you garnering page views or are you changing people’s lives? In other words: is “attention” the goal, or is the “effect” the goal? This is a critical difference. And yes, these things can be results of a deeper effect on people’s lives. That, if you get 100 comments on every blog post, then clearly, you are having some effect on people’s lives, otherwise, they wouldn’t waste their time. But as writers, authors, media companies, small businesses, and individuals move their life online, I wonder if we judge too quickly if we fail or succeed. I know people who have thousands of Twitter followers, who struggle to make a living in their business; And others who have very few Twitter followers who have an incredibly successful career. I’ve noticed that sometimes you can have a blog post read by VERY few people, but if they are just the right people, that it can have a profound effect on their lives. And that growing one’s business isn’t about reaching masses of people, but simply connecting with the one who needs your products or services. Is your purpose to change people’s lives, or merely grab their attention? As we all feel the pressure to be “social media rockstars” – to have a follower count that lives up to our resume, I can’t help but feel that this is the wrong way to measure success. I don’t want to be a rockstar. I don’t want to stand on a stage in leather pants and shout into a microphone. I don’t want to crowd surf. I don’t want to dive from a wall of Marshall amplifiers. I simply want to talk to people. Learn about them, what they want, what they need. And then help build that. Because that is creating something for the world, something beyond myself. Social media is not about elevating my own standing – becoming a “rockstar” – but rather, it is about connecting, learning, and helping. It is about weaving myself into the fabric of the communities I serve, and helping others succeed. I don’t want to be a rockstar. I want to be a teacher. Not because of what students learn from me, but what I learn from them. Not because of how they empower me, but how I empower them. 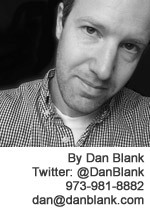 If you think I can help you empower your community, let me know: @DanBlank, 973-981-8882 or dan@danblank.com. Previous post: You Don’t Sell To A Community. You Support A Community.